During the ages of 11-13 I lived in Irkutsk, Russia with my family. So much of my life has been shaped by those years. When there is a bowl of soup in front of me, you can bet I will put sour cream in it. The smell of dill is synonymous with summer in my mind. I believe that eating ice cream in freezing temperatures will keep you warm and I draw a line through my " 7 " s and " Z " s.
Also, I still speak to cats in Russian. I'm not sure why, it is just one of those things that stuck with me. I wish it was a more useful skill that remained from my time there, like knowing how to tell which berries can be eaten in the woods. That would be helpful to remember. Instead it is the cat quirk that has stayed with me. And I was accepted. I was accepted for the perception of myself I put out there. The bummer was that the acceptance felt really limited to me. My peers weren't accepting the Russian speaking, politically driven, and senior citizen loving teenager that I really was. In college it all came out. Time had taught me to embrace some of the cross-cultural traits I had picked up. I developed my friendships differently - high outer walls and low inner walls. I made factual statements in question form and tended to clap in unison with the person next to me. I stopped hiding all the little things I was so insecure about before. Shout out to hipsters for making quirky cool I guess. I wasn't afraid of who I was anymore. Encouragements were breathed in deep and owned because they were spoken to the real me. Sure, I am still quirky. I'd like to think it is charming in a Zoe Deschanel kind of way, but it probably isn't. And it doesn't matter really because it is who I am. So many of us are surrounded by people who care about us, but we still don't feel loved. Perhaps it is because we aren't being honest and showing them our true selves. The cat thing is a funny example, but there are more serious things we keep hidden. Our sins, our weaknesses, past failures or deeply rooted insecurities. Maybe you struggle with depression and are afraid people will misunderstand you. Perhaps you think your religious beliefs will be judged or maybe you are afraid your personality isn't right. I believe we were all made to be loved. By God and by others. So be yourself - insecurities and all - and be loved for it. 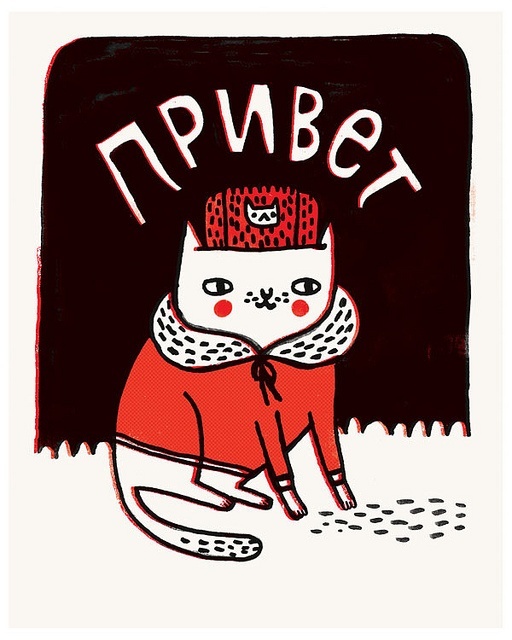 And if you speak to cats in Russian too, let me know. We could start a club.